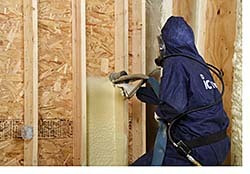 LD-R-50 castor oil-based open-cell spray foam insulation for exterior wall applications is approved for Type I-IV for commercial projects in addition to the product's approval for Type V exterior wall use. It is 100 percent water blown and provides an R-value of 3.7 per inch. HFC- and PBDE-free.